It may be hard to believe that I actually cooked and baked whilst on vacation, but I am not kidding when I say that is the truth. The first few days back at my parent’s house, I just sat back was quite contented to let myself be served. Sure, I helped out doing the dishes and tidying up, but it was kind of nice to not worry about planning what to eat or even lifting a finger to make it happen. Dinner was going to be on the table without my help. But a few days of relaxation and I figured it was time to do a bit more than sing for my supper. My mom had set out a recipe she wanted done and while she was out giving French lessons, I hopped into the familiar kitchen and got down to work. With help from both my dad and Cornelius (shocking, I know! ), we put together a delicious grapefruit pork loin dinner with scallopped potatoes and some greens. Dinner was a true success and it was the best meal of my stay in the forest city. We left London after nearly a week and spent our last remaining days in Toronto visiting my dear friends Craig & Aaron in their newly purchased and very lovely home. I’m trying to not be such a bum house guest, so it was decided that I’d made up a batch of homemade cookies, substituting dried sour cherries and pecans for the raisins & walnuts in the original recipe. While we waited for the cookies to bake, we drank Aaron’s signature drink, “The Flaming Aaron” which consisted of very fine champagne and chambord, a black raspberry liqueur. Yum! 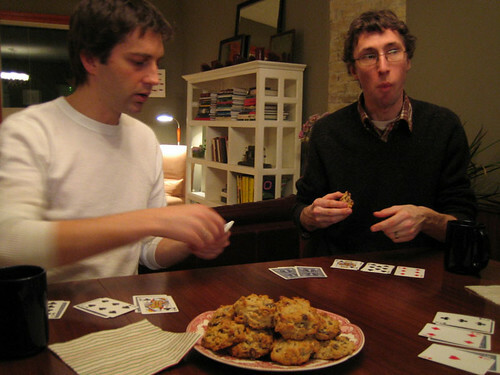 The picture is of Aaron and Cornelius playing Brutefitta, while Cornelius stuffs the cookies into his mouth. Yes, good times were had! Even though we just got back from vacation we decided to treat ourselves to a night away at the Sylvia Hotel (a wedding present we finally decided to use) and acted like tourists in our town by drinking fancy drinks at the high in the sky rotating restaurant and eating Malaysian at the very reasonable (cheap) Banana Leaf. However, tonight I decided to jump back into reality and Cornelius and I went grocery shopping and decided to make shredded pork tacos for dinner. Since I was pretty experienced with pork loin (having just made it at my mother’s house), I expected nothing less than perfection. After I removed all traces of fat, I rubbed the meat with a mixture of salt, cumin, coriander, chili powder, and chipotle powder and placed it in my casserole dish. I then poured half a bottle of beer and some orange juice around the meat. I preheated the oven to 350 degrees, put the lid on the dish and waited til the apartment started to smell real good, about an hour or so. I then mixed up a bit of brown sugar in a bit more orange juice and poured it over the pork mixture and set it back into the oven for another hour or so. I kept checking the meat making sure it wasn’t dry and occasionally adding more o.j. or beer. When the meat was done, I took 2 forks to the meat and it shredded like magic! So moist and super flavourful it was! 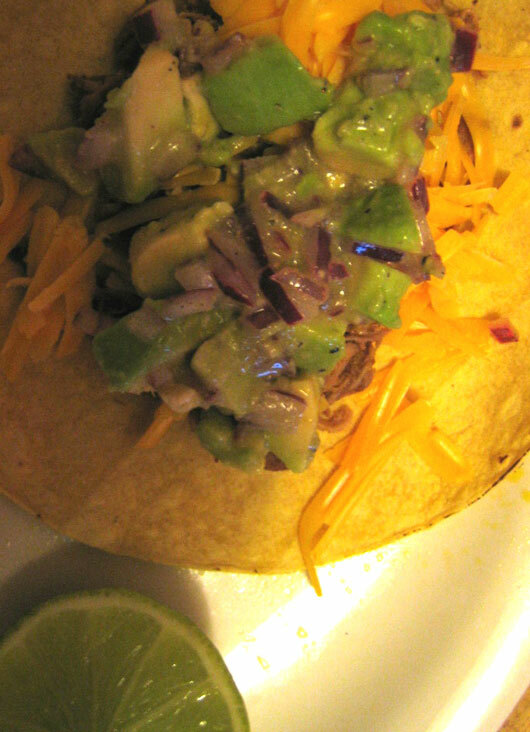 We put a dollop of the meat on a flame-heated corn tortilla, topped it with grated cheese and avocado doused in lime juice. A simple cabbage salad was served along side for some added crunch. After being in beautiful kitchens, it was actually nice working and living in our small but well used kitchen. Perfection achieved. Wow! You’re so creative…I love that you just came up with all that on your own. Mmmm, getting industrious with the pork…very nice. Yum, those tacos sound great. But “The Flaming Aaron” sounds divine! i had no idea houses were so expensive in vancouver! I’m with Rorie. Tacos – yes! “The Flaming Aaron” – yes PLEASE! Thanks Crystal! It’s pretty easy coming up with something for dinner. I don’t have that knack when baking! Yes, Nosheteria, I don’t often cook with pork so it was a nice experiment. Thanks Rorie! Mmmmm, a flaming Aaron!! Tania, houses are just too out of reach for us. Even ugly condos are too expensive. I do love Toronto but I can’t convince Cornelius to make a move there…even with cheaper housing prices! Amy, we usually try to eat fairly vegetarian (I was one for 10 yrs), but pork was a nice diversion! Yum!! Yes, the best meals from the forest city are ones you cook yourself. Im not that impressed with the restaurants there.